The Watchdog notes: This is an abridged version of an article I wrote for RES Magazine, vol. 3 no.2. Professionals exercise complete control over their camera's lens� zoom and focus functions, and more. And in order to get rock-solid shots that look great, they do this often without touching the camera at all. Anybody who's ever tried a slow zoom on a DV camcorder knows just how difficult this can be. With your right hand on the tripod pan handle, you reach over the top of the lens with your left hand� underneath the microphone, bumping into it, making noise, bumping into the lens barrel, causing an image shake, and then you have to carefully hold just the right amount of pressure on the zoom rocker, and� Oops. Blew the shot, again. Hey, it's happened to the best of us, right? Well, the pro's don't have that problem on the expensive gear. There's your difference between professional and prosumer camcorders, and now you can kiss that difference goodbye because the dividing line has finally evaporated. In television news studios, professionally photographed sports events and medium-to-high budget location shoots, expensive high-end cameras are used only with remote lens controls, usually mounted on the tripod pan handle. The operator stands comfortably behind the camera and does everything from the pan handle handgrips -- recording, changing focus and focal length (zooming), and more. Not only is this method easier than leaning over the camera trying to work it while tape is rolling, but it also produces stable, rock-solid images. These controls used to be very expensive accessories that separated the big boys from you and me. But now, there's a similar tool that's affordably priced which plugs into your camcorder's LANC jack (standard equipment on all Sony and Canon prosumer DV camcorders). It's called a VariZoom. One way to use it is to clamp it to your tripod pan handle, and suddenly you're in the big league, with variable-speed zoom, focus and more, without having to touch the camera� just like those union crews who get to do this sort of thing for a living. 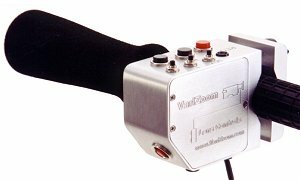 The VZ-Pro-LX from VariZoom Lens Controls is similar in appearance to the VZ-Pro-L that I reviewed in 1999, but with a few important differences. Like the previous model, it's basically a stylish-looking, brushed aluminum box with a mounting clamp on one side and a large, comfortable foam-covered handgrip at the back. The tripod mounting clamp has changed from four small screws to two bigger ones which are easier to tighten by hand (and sport a quick-release feature for fast set-up and breakdown). VariZoom has switched to this new clamping system for all of their Pro-Series lens controllers. The VZ-Pro-LX also offers a new way to perform zooms. 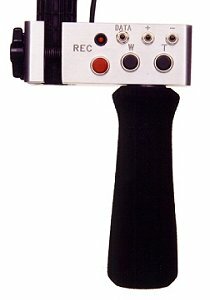 Instead of the traditional zoom rocker, there are two buttons (one for wide, one for telephoto) where the rocker used to be, within easy reach of your thumb as you grip the controller handle. The buttons provide a soft, smooth touch for activating zooms, and they eliminate the biggest problem with all DV camcorders� the pressure-sensitive rocker. To explain why, it's necessary to briefly discuss how zooming works on DV camcorders in the first place. Unlike expensive professional video lenses, DV camcorder lenses can move only within a certain range of available zoom speeds (they are digital cameras, after all). Instead of a smooth blend of analog ratios, these digitally-controlled lenses are limited to a handful of fixed speeds� eight zoom speeds in and eight speeds out on the Canon XL1, for instance� and this camcorder has more zoom speeds than most others. The XL1 also has a very nice, dead-slow crawl; a highly desirable feature for getting those almost imperceptible creeping zooms that are stylish and popular in documentary filmmaking and event videography. But to utilize this particular zoom speed on an XL1 right out of the box, you've got to hold the zoom rocker with just the right degree of pressure, and keep it there for the entire duration of the very slow zoom. This requires a very light, exact touch and is quite easy to screw up, even on a tripod. The slightest fluctuation in fingertip pressure will ruin your shot� the lens will either speed up too fast or stop completely. Thanks to the VariZoom, however, this type of focal-length change while rolling tape is extremely simple because there's no pressure-sensitive anything. Just dial in the desired zoom speed using the speed-control knob located below the grip handle. 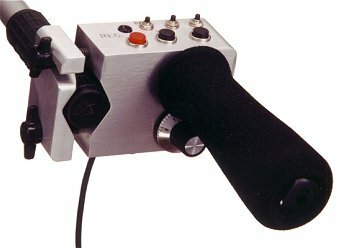 With your hand on the controller grip and your thumb over the wide & tele buttons, your index finger naturally falls on this dial. Whatever you set this dial to becomes the zoom speed you've got on the wide & tele buttons on top of the controller. You can set the controller for that dead-slow creeping zoom and not have to worry about holding just the right amount of pressure. In fact, you can leave the speed-control setting where it is, and have the exact same zoom speed every time, over and over again, guaranteed. Even better, if you want to change speed during a zoom, that's a very simple process, too. Just roll the speed-control dial with your index finger while pressing a zoom button. Start out slow, ramp up to a faster speed, then slow back down again, all in one move. And unlike other controllers that force you to choose from a few pre-determined zoom speeds, the VariZoom gives you access to the entire range of speeds that any particular camera is capable of (including, in some cases, a notch or two faster or slower than what you could get from the camcorder's own zoom rocker). This versatility alone makes the VariZoom an extremely useful production tool� but wait, there's more. The VZ-Pro-LX also gives you precise control over focus as well as zoom. A pair of buttons on the bottom side of the controller moves the focal plane either closer to or farther from the camera lens. The speed at which the focus changes is about medium -- fast enough to perceive a change in focus, but slow enough to let you stop exactly when the element you want to focus on is clear and sharp. With practice, you can perform a rack focus between two object in the frame that are positioned at different distances from the camcorder. This is a lot more useful than having just a simple push-to-focus button. With the ability to move the focal plane around at will (without having to touch the lens at all), you have a whole new dimension of image control that can provide for some very interesting shots. Of course, you'll also often use the controller's focus buttons as a quick method of setting critical focus during a set-up. Just zoom all the way in, adjust the image so that it's nice and sharp, and zoom back out� now all elements within the frame will be in focus no matter what focal length you decide to shoot at. Rounding out the VZ-Pro-LX's list of features are additional buttons for record start/pause, frame search forward and back, data on/off, wake-up from standby, and an LED-recording indicator. The small search buttons work in the record pause mode, letting you advance the tape forward or back to cue a specific frame, useful for those times when you're editing in the camera. The data button toggles on (or off) the viewfinder display information going out over the analog video outputs. This is a key feature for anyone who's recording the video output on an external deck. Many DV camcorders, most notably the XL1, have no onboard switch for this purpose, which up to now meant that you had to remember to bring your IR remote along on shoots. With the VariZoom, you can leave the otherwise worthless remote at home and switch off the external display info right from the pan handle. The wake-up function, activated by a recessed button on the side of the controller, will power up a camcorder that has timed out into "sleep" mode (camcorders will do this automatically to prevent excessive wear on the tape heads). The ability to wake up a camera remotely is especially useful when the camera is mounted in a hard-to-reach area; up on a crane, for instance. Without this feature, you'd have to pull down the crane, ruin your shot, manually reset the camera power, and then set up your shot all over again. And we all know that's not cool. As soon as your talent sees that crane come down, they'll think it's a thirty-minute break and head for Starbucks. The VZ-Pro-LX connects to any Sony or Canon DV camcorder through the LANC input. Sometimes labeled Control-L, it's the little, obscure jack that's too small to plug anything into. In fact, you've probably never used it or noticed it before. The controller requires no external power. Its draw on your camera battery is the same as using the zoom rocker on the camcorder. The controller cable itself is six feet long, but extensions up to 100 feet are not a problem. Although the VariZoom seems tailor-made for tripod use, it can also clamp to a shoulder brace grip, a camera crane handle, or just about anything else. For small camcorders like the Sony TRV-900 and PD-100A, VariZoom has a nifty little right-angle bracket that fits into the VZ-Pro-LX clamp. Mount the camcorder onto the bracket, and you have a pistol-grip style mini-monopod with camera controls, which makes hand held shooting with smaller camcorders a lot easier. Your good nature will bring you much happiness.